The 14 Jazz Orchestra is comprised of 13 of South Florida’s premier Jazz and studio musicians. Under the direction of Dan Bonsanti, the ensemble includes distinguished Jazz educators currently on the music faculties of Miami Dade College, Barry University, Florida Atlantic University, and the University of Miami. Individually, the members of “THE 14” have recorded, toured, and/or performed with many of the greatest Jazz and Pop artists of our time, from the big bands of Stan Kenton, Maynard Ferguson, Mercer Ellington, and Woody Herman to such Jazz artists as Billy Eckstine, Sarah Vaughan, Jon Hendricks, Mel Torme, Jaco Pastorius, Stanley Turrentine, The Brecker Brothers, Eliane Elias, Bob Mintzer, Bob James, and Arturo Sandoval, just to name a few. Their collective resumes also include Frank Sinatra, Tony Bennett, Peggy Lee, Nancy Wilson, Ray Charles, and Pop/Rock artists as diverse as Barbara Streisand, Marvin Gaye, and The BeeGees. The ensemble takes a Contemporary Jazz approach to a wide assortment of styles, performing compositions from Jazz composers such as Billy Strayhorn, Joe Henderson, Chick Corea, John Scofield, and Wayne Shorter and pop/rock artists such as Paul McCartney and John Lennon. 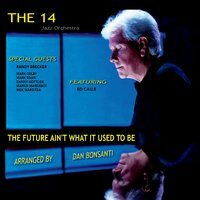 Well, Dan Bonsanti and his THE 14 Jazz Orchestra, and with superb specials guest jazz musicians and distinguished featured guest Ed Calle (Latin Grammy Winner) have done it again. This new Jazz CD entitled " THE FUTURE AIN'T WHAT IT USED TO BE" is a highly likable; highly accomplished; fresh and brilliant compilation of 11 jazz songs. I appreciate this exhilarating body of work, Favorites of mine are Rice Pudding; Blue Miles; Triste; 16 Tons (Give or Take) . The entire CD is awesome. Thanks Dan and THE 14 and special guests and Ed Calle....Bravo!